If you are a food blogger or considering starting a food blog, I hope this post helps you! That said, we make most of our money through sponsorships. We try out products and use these products to create thoughtful, yummy recipes. Brands pay us to do this because we have built a social following and get traffic to blog posts, so it is advertising for them. We ALWAYS disclose these relationships. We also make money through affiliate products, consulting, etc. It is never good to have all of your eggs in one basket. But our favorite and most profitable “egg” is definitely working with sponsors. If you want to learn more about how to make money with sponsored blog posts, what to charge, how to find sponsors, etc… you are in luck! We have written an entire BOOK about this topic, which will be available for purchase very, very soon. Running a successful blog is all about two things: Content and Traffic. You have to have high-quality content, and you have to post it regularly. It is no surprise that the most popular food blogs typically post 3+ times per week, and have high-quality photos and interesting posts. But all the high-quality content in the world does not help you if no one reads it. You need TRAFFIC. Traffic is the key to making more money as a blogger. Send out blog posts via email. I use Convert Kit for this, but other options include AWeber, MailChimp, and MailerLite. You can manually create a weekly newsletter, or you can have posts go out automatically. Either way, it reminds people that you exist. Use Tailwind and join tribes. Signing up for Tailwind is BY FAR that best things I’ve done for my blog in 2017. Tailwind allows you to automatically schedule pins, so you don’t have to live on Pinterest. “Tribes” are groups of bloggers where everyone shares one another’s posts so you get more traffic. You get a free trial just for signing up. I have a food blogger tribe here that you can feel free to join if you want to connect with more food bloggers. Make sure it is easy to share you links. Every blog post should have share buttons at the top and bottom of your blog posts. Do not make people search for them! I’m on WordPress and use the Sharaholic plugin to add these buttons to this blog. Add related links to the bottom of every post. There are plugins that other tools to do this automatically for you, but I actually prefer to add links and images manually. If you scroll to the end of any recent recipe post, you’ll see a list of 2-3 related recipes. This helps keep people on your site longer, clicking around, so you boost your traffic. Learn about SEO. Search engine optimization (SEO) is complicated, but it is basically how to write posts in a way that allows them to show up in search results when people are googling for recipe ideas. This is a guide to SEO for beginners that helps me learn the basics. I’m honestly just scratching the surface here. If you want to learn more about traffic, I highly recommend the ebook 21 Strategies I Used to Increase My Monthly Page Views from 17k to 400k+ in 10 Months. It is a little pricey, but worth every penny in my opinion. I had not helped me hit 400K yet, but we are on the right track. And now… it’s time for FRIDAY FRENZY! Hi Y’all! It’s Melissa from MelClaire and I’m your host for this week’s Friday Frenzy Link Party. I’m so excited to be co-hosting this great weekly Link Party and that this week I get to choose the featured posts! We had so many great posts added to the party last week, it was really hard to choose my favorites. It’s always so much fun visiting your sites, finding new recipes and projects. Thanks so much for joining us this week!! The first feature this week is this adorable Sewing Cabinet Refurbished with Yard Sticks! Don’t you just love it? I really love re-purposed furniture and this sewing cabinet is so darn cute and original, it made my crafty heart sing!! When I saw this cake with caramel frosting, I knew this was something I could not pass up! 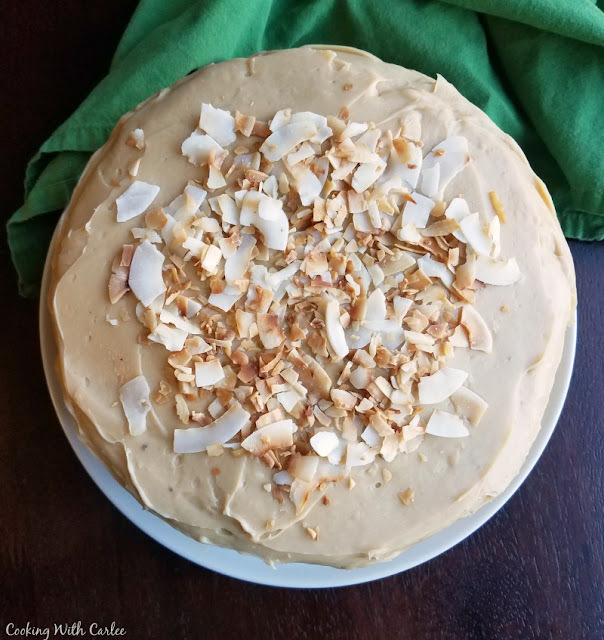 Cooking with Carlee’s Creamy Caramel Sweetened Condensed Milk Frosting looks absolutely heavenly. It’s definitely on my list to make very soon. Yum!!!! The last feature this week, is certainly not least. When I saw this picture and recipe for the Quintessential Green Chile Cheeseburger from MJ’s Kitchen, I knew this had to be on our menu at home ASAP. It’s a beautiful burger, don’t you think? Mmmmm, I can’t wait to try it! Now it’s time for you to link up your latest and greatest posts. Who knows? Your post might be featured next week!! This entry was posted in Friday Frenzy Link Party and tagged blogger tips, Friday Frenzy. Bookmark the permalink. Yay!!! Thanks for the feature… and I joined your tribe! Have a fabulous weekend! Thanks to you all for featuring my chile burger!! !